A long-ago comet might have done in most of Montana's dinosaurs, but there's still a few haunting the capitol in Helena, and this guy hanging out along the hi-line, in the suburbs of greater Rudyard. 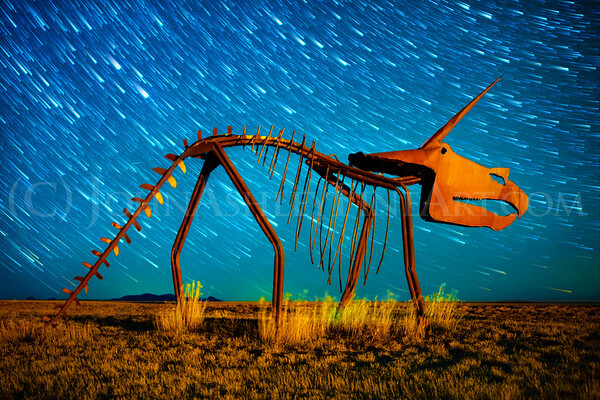 The hi-line's "Dinosaur Trail" also harbors a string of museums and a few dino digs. A young lamb rests peacefully in a bed of straw, under the nurturing care of its mother. Behind the lens. Everyone responds to this photograph with a universal, "Aaaaaaw!" This is a good example of how camera angle influences how we respond to an image. 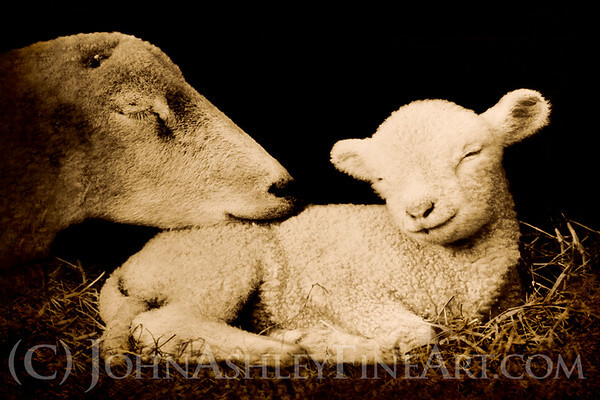 I created this intimate image of a ewe and her lamb by getting down at eye level (and crawling around in some interesting-smelling straw). How boring would it look if I'd photographed the very same scene from a standing position? Boiled down to basics, photographing people and animals from above makes them look relatively smaller and weaker. Photographing from below makes the very same subject look bigger and stronger. But we feel the strongest connection when we are looking at the subject eye-to-eye. Call it, "The Aaaaaw Effect.". 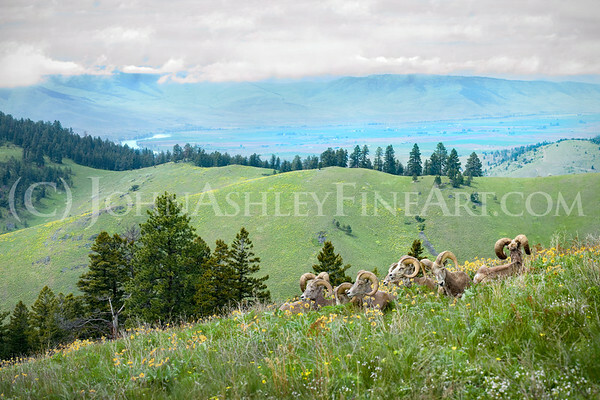 A herd of bighorn sheep rams rests among the yellow balsamroot flowers of a spring time mountainside in western Montana. Behind the lens. I like customer compliments, of course, but what I love are those moments when wild animals allow me into their personal space. Their acceptance makes the occasion - and the resulting images - stand apart as something memorable. 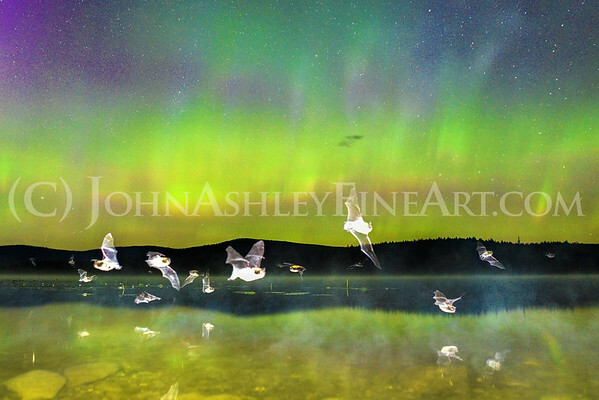 Bats forage over Montana's Island Lake during a 2 a.m. aurora. 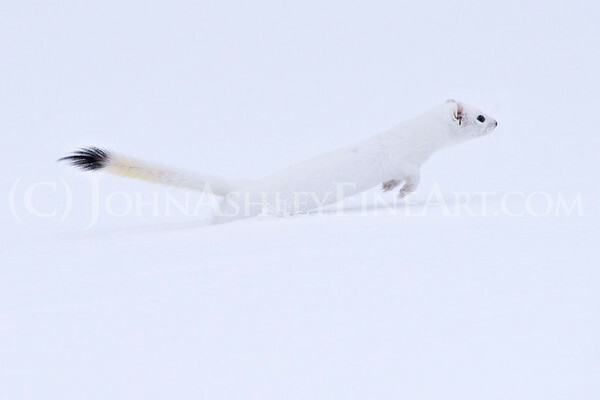 An ermine is only an ermine in winter, when it's fur is white. During the rest of the year, it wears brown and yellow fur and is called a short-tailed weasel. 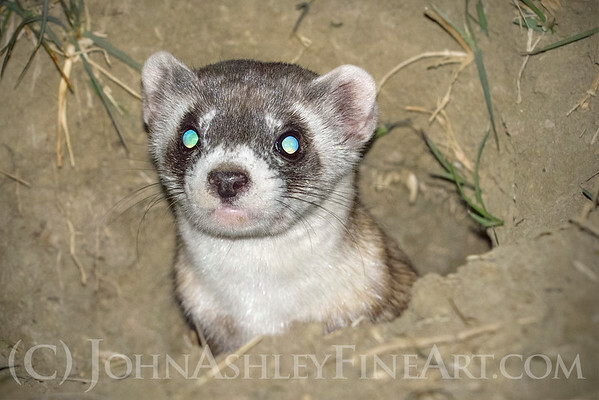 A rare black-footer ferret peeks out from a prairie dog burrow at night. The eyes of our native ferrets reflect an emerald-green "eyeshine," and conservation biologists use spotlight to search for this glow during the wee hours. 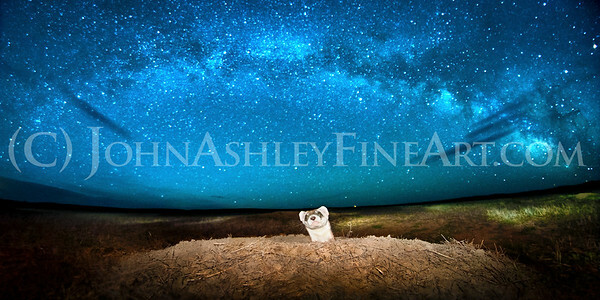 An endangered black-footed ferret looks out from a prairie dog burrow to find the Milky Way crossing the midnight sky. Ferrets are native, nocturnal animals who are most active in the we hours of the night. 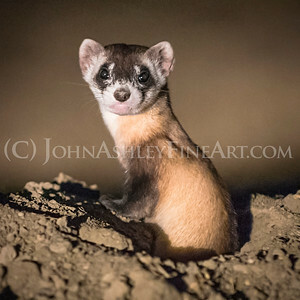 A female black-footed ferret kit watches the midnight prairie from the safety of a vacant black-tailed prairie dog burrow, in central Montana. 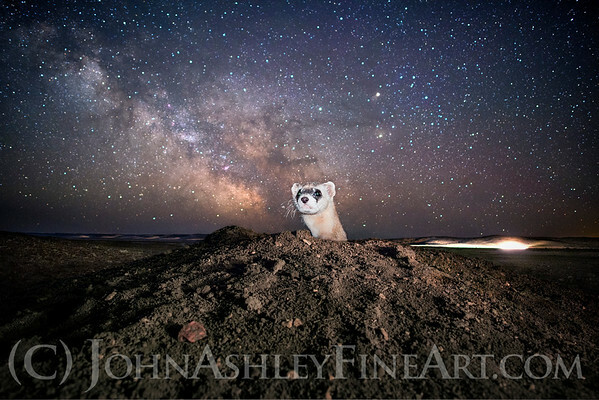 One of Montana's rarest animals, a black-footed ferret, becomes active around midnight when the sky is filled with stars. Our native ferrets were thought to be extinct at one time, and now there are fewer than two dozen making the midnight rounds in eastern Montana. Rocket — a horse at Dunrovin Ranch — grazes peacefully (and safely) in the town of Lolo, Montana, while a forest fire blazes up the flank of Lolo Peak, west of town. 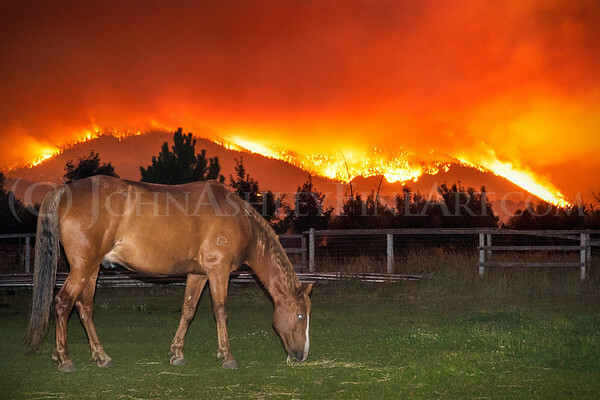 The horses here were never in any danger, and horse owners from nearby forested areas brought their own animals here for safety during the fire. 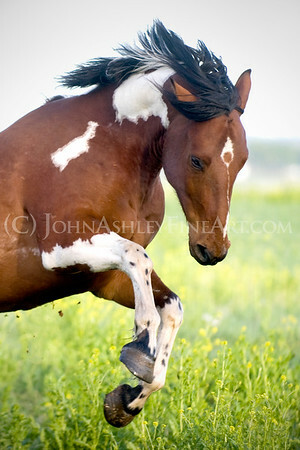 Isaac is a four-year-old paint who found his "forever" home thanks to the Montana Horse Sanctuary near Simms, Montana. The Sanctuary is a non-profit which helps in-crisis horses and horse owners. Learn more at www.MontanaHorseSanctuary.org. "That Was a Good One!" 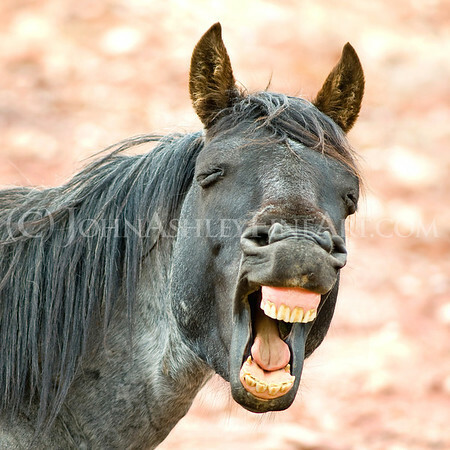 A wild stallion appears to enjoy a good joke, but he's really just smelling and gesturing towards his mares. 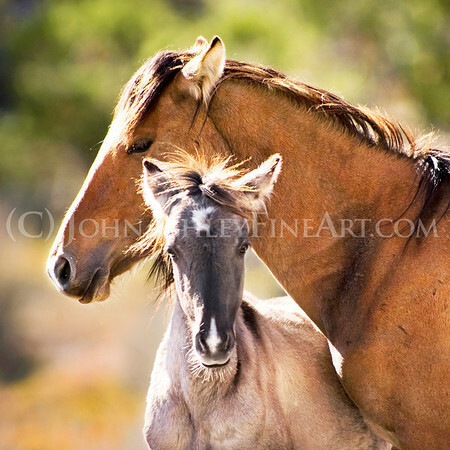 Montana's last band of wild horses live in the Pryor Mountains, in the southeastern corner of the state. You can learn more about Montana's wild mustangs by visiting the Pryor Mountain Wild Mustang Center. 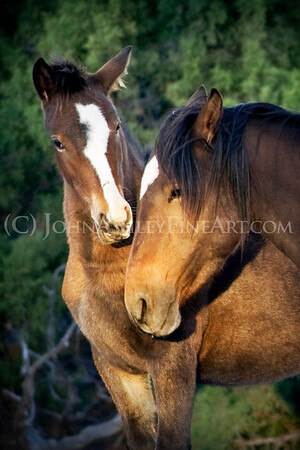 A young mare, "Halo," nuzzles her very first foal, "Kaelia," at the Pryor Mtn. Wild Horse Range, in southeastern Montana. Both are free-ranging, wild horses. To learn more about Montana's wild mustangs, visit the Pryor Mountain Wild Mustang Center. "Buffalo Girl" keeps a loving watch over her four-month-old foal, "Kitalpha." They are among the free-ranging horses at the Pryor Mtn. 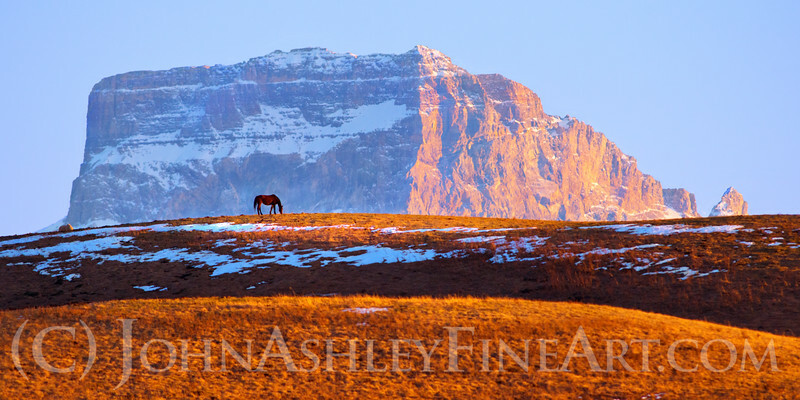 Wild Horse Range, in southeastern Montana. To learn more about Montana's wild mustangs, visit the Pryor Mountain Wild Mustang Center. Happy, a young mare, enjoys a peaceful moment at Montana Horse Sanctuary in Simms, Montana. 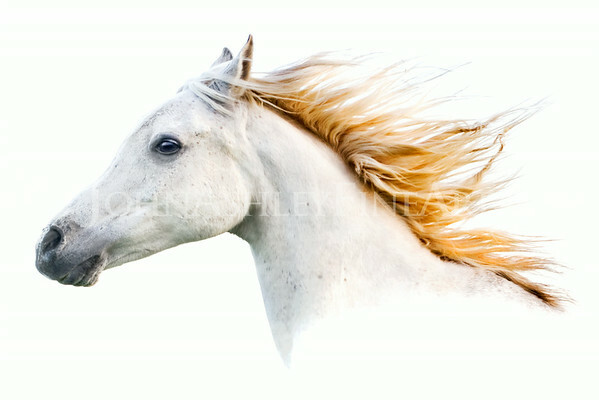 The Sanctuary is a non-profit that shelters and assists in-crisis horses and their owners. To learn more, visit www.MontanaHorseSanctuary.org. . Although not a “rescued” horse, Dancer provides therapy to Montana Horse Sanctuary horses through play and friendship. The Sanctuary is a non-profit that shelters and assists in-crisis horses and their owners. 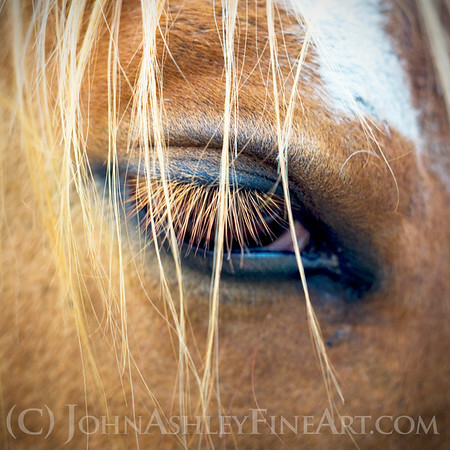 To learn more, visit www.MontanaHorseSanctuary.org..
"Who Nose Where This Might Lead?" 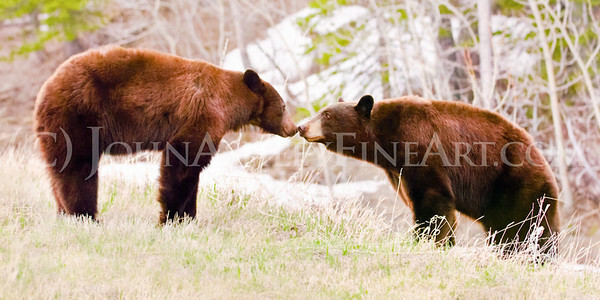 A male black bear (right) cautiously greets a female nose to nose. During spring the young couple will travel together for a few days before parting ways again. Note - these are two wild and free-ranging back bears. Learning to recognize sounds is a big part of growing up as a bear cub. When these black bear cubs hear something they don't recognize, they run together and look at mom. Based on her reaction, the cubs learn the appropriate response and file that information to memory. A bear who can raise two cubs through their first summer is a good mother. But raising three cubs, like this black bear mom, requires all of the skills of a Montana matriarch. 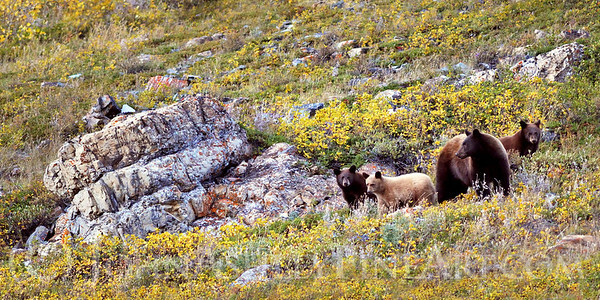 This family grew up in the Many Glacier Valley, and the cubs are grown now and on their own. A mother black bear stands on her hind legs to check her cubs who are feeding nearby. It goes without saying, but bear mothers are very protective parents. 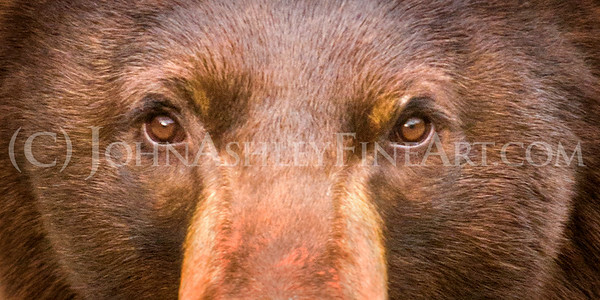 Some books say that bears have "poor" vision, but it's comparable to ours. Bear vision is only poor in comparison to their incredible sense of smell.